1 – Heat fat in 12-inch, deep skillet over medium heat. Add onions and sugar, stir well to coat with fat. Sauté onions, stirring frequently, for 10 minutes, or until starting to turn golden brown. Add beer, scraping up any browned bits from bottom of pan. Add bay leaves, lower heat and simmer for about 10 minutes. Stir mustard into onions, remove from heat and set aside, discarding bay leaves. 2 – Grill bratwurst over medium-hot fire, turning to brown evenly, until nicely browned and internal temperature reaches 160°F (70°C) on an instant-read meat thermometer. Remove from grill and add to skillet with onions. Over medium heat, cook and stir until sauce becomes syrupy. 3 – Serve bratwurst in rolls, generously smothered with the braised onions. Nutritional Information Per Serving (1/4 of recipe): Calories: 620 calories; Protein: 22 grams; Fat: 40 grams; Sodium: 1023 milligrams; Cholesterol: 75 milligrams; Saturated Fat: 15 grams; Carbohydrates: 36 grams; Fiber: 3 grams. For Breakfast it was a couple of Jennie – O Turkey Breakfast Sausage links and a toasted Healthy Life Whole Grain English Muffin. Along with my morning cup of Bigelow Decaf Green Tea, I was set to start my day. After Breakfast I headed up to the local Kroger, I needed a few items and Mom needed a couple of things. Back home got everything put away and did some light cleaning. I spent the afternoon yesterday over seeing Dad at the rehab center. He’s finally getting stronger and walking with a walker on his own. He’ll be home Tuesday! So anyway I didn’t get a whole lot of sleep last night, Phantom Pains started a little after midnight. Hate dealing with those, so painful and aggravating! For dinner tonight I prepared a Bluegrass Lean Bratwurst w/ Baked Potato Puffs. While digging in the freezer I found a couple of packages of Bluegrass Deliciously Lean Bratwurst. These are so hard to find in this area, I had to write Blue Grass Meats last year because no local stores had any of them in stock. Finally Kroger started to carry them for a while so I had bought a couple of packages of them and forgot I had them, until yesterday! 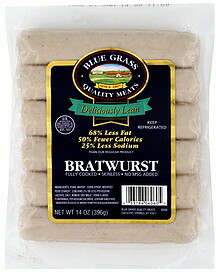 Love the Blue Grass Lean Bratwurst which are 100 calories and 4 carbs per Brat. To prepare them; Just add the Brats to a large skillet and add water, until the Brats are half way covered. Bring them to a brisk boil but then immediately turn down the heat to a very low boil, more of a simmer than an active boil. Simmer for about 15 to 20 minutes, then finish off in a pan with just the Brats and a little Extra Virgin Olive Oil to get a nice crispy char and finish. Love this method, if you can’t grill them. Delicious, plump, and they cook up great! Served it on a Kroger Lite Wheat Bun topped with French’s Spicy Brown Mustard. Then for a side dish I prepared something new, Alexia Potato Puffs. To prepare them; Preheat the oven to 425 degrees F. Arrange the frozen potatoes in a single layer on a baking sheet lined with foil. Baked for 25, stirring halfway through the cooking time. And Bam got another Keeper Potato Product! Browned up perfect with excellent seasoning. For dessert later a Healthy Choice Dark Fudge Swirl Frozen Greek Yogurt. Our warmest day in quite sometime around here, 70 degrees and sunny! Started the day off with a Poached Egg on a Healthy Life Whole Grain English Muffin, and my usual cup of Bigelow Decaf Green Tea. Got some things done inside and then got the 4 wheel cart out for most of the afternoon, good to get out in beautiful weather! 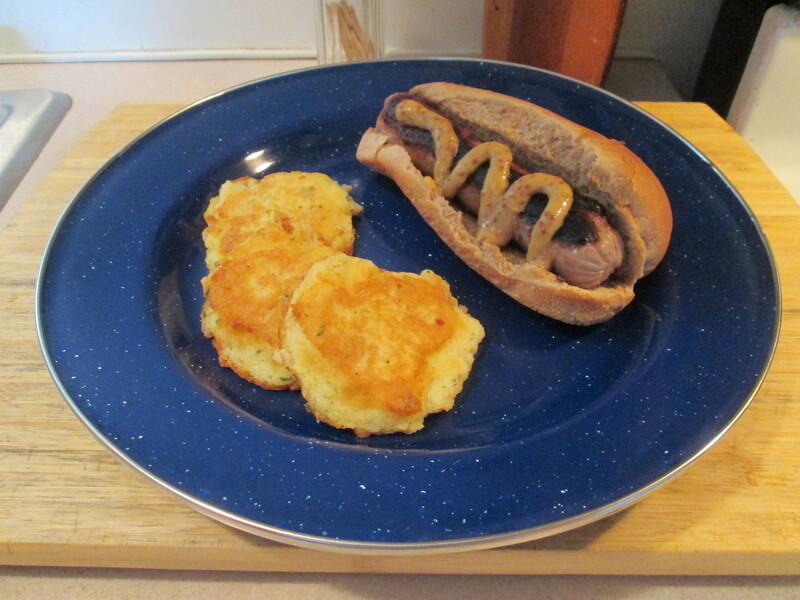 For dinner tonight it’s Bluegrass Lean Bratwurst w/ Potato Pancakes. 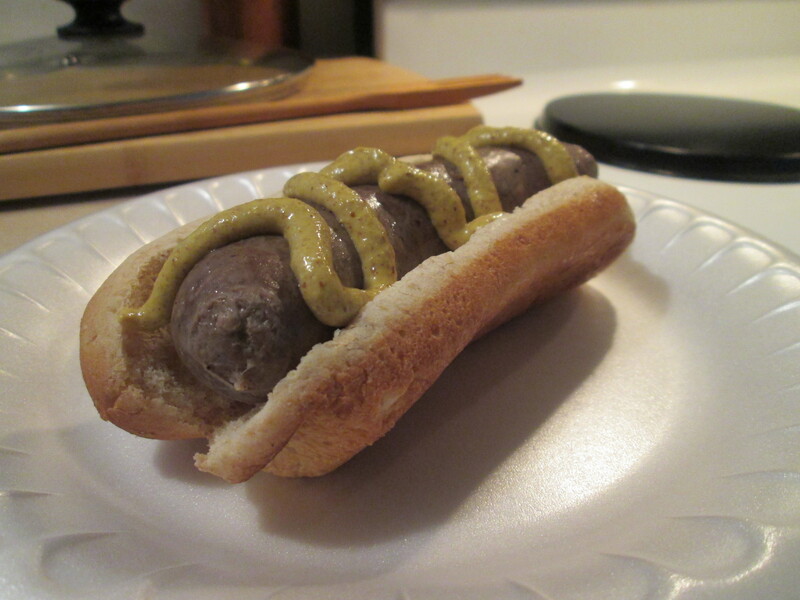 I used Blue Grass Lean Bratwurst which are 100 calories and 4 carbs per Brat. To prepare them; Just add the Brats to a large skillet and add water, until the Brats are covered. Bring them to a brisk boil but then immediately turn down the heat to a very low boil, more of a simmer than an active boil. Simmer for about 15 to 20 minutes, then finish off in a pan with just the Brats and a little Extra Virgin Olive Oil to get a nice crispy char and finish. Love this method, if you can’t grill them. Delicious and they cook up great! Served them all on Aunt Millie’s Reduced Calorie Hot Dog Buns and topped with Private Selection Sweet Hot Stone Ground Mustard. 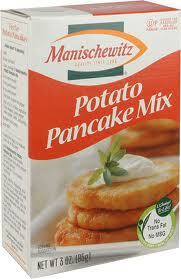 For a side I prepared some Manischewitz Potato Pancake Mix, my favorite (Never made a cake I didn’t like!). Just add 2 Egg Beater’s (1/2 Cup), 2 1/4 Cups Water, to the mix stir and fry! 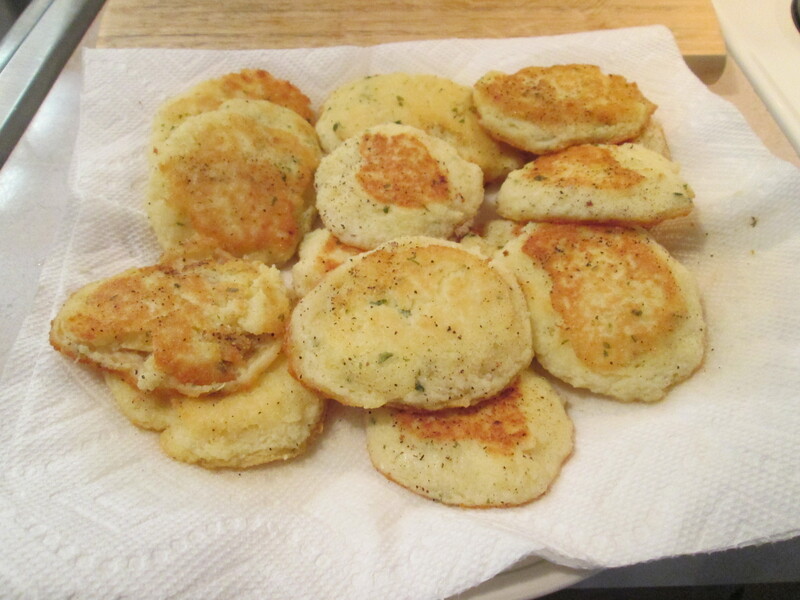 Easy and makes one good Potato Pancake and their only 80 calories and 18 carbs per serving (3 Potato Pancakes). For dessert later a Jello Sugar Free Dark Chocolate Pudding. Potatoes ( Contains Sulfites to Maintain Whiteness), Potato Starch, Salt, Onion, Vegetable Shortening (Partially Hydrogenated Cottonseed Oil). Makes 18-24 pancakes. You Will Need: Medium bowl, 2 eggs, 2 1/4 cups cold water, vegetable oil, large skillet. 1. Mix: In a medium bowl, beat two eggs with a fork until blended. Add 2 1/4 cups cold water and mix well. Stir in the contents of this package. Allow batter to thicken for 3 to 4 minutes. Stir. 2. Fry: Drop tablespoons of batter into 1/8 inch hot vegetable oil in a large skillet and brown on both sides. 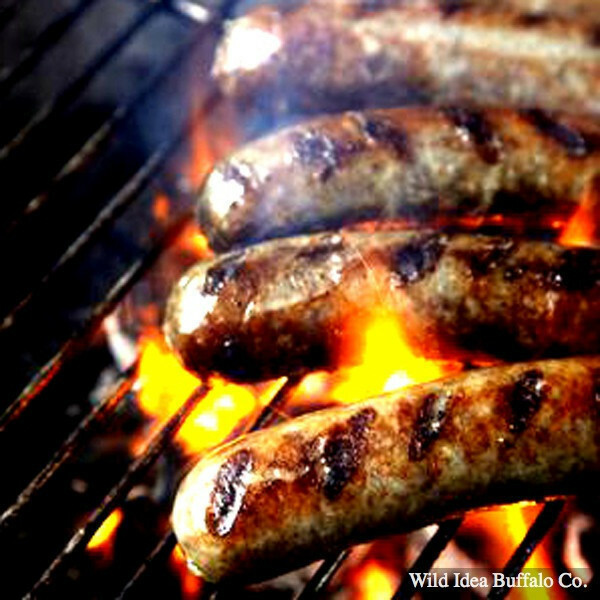 Wild Idea Buffalo – Buffalo Brats! I had ordered a Wild Idea Buffalo Holiday Package that included a 1 lb. package of Buffalo Brats. So today for lunch I prepared my first one. It was real easy to prepare; just put about a 1/2 ich of water in a medium skillet and heated on medium heat. As the water started to boil I added the Brat and put the lid on, Cooked for about 10 minutes and removed the lid and let it cook another 4 minutes. It’s one good Buffalo Brat! Seasoned just right and very tender. Just another one I’ll have to keep in stock in the freezer. 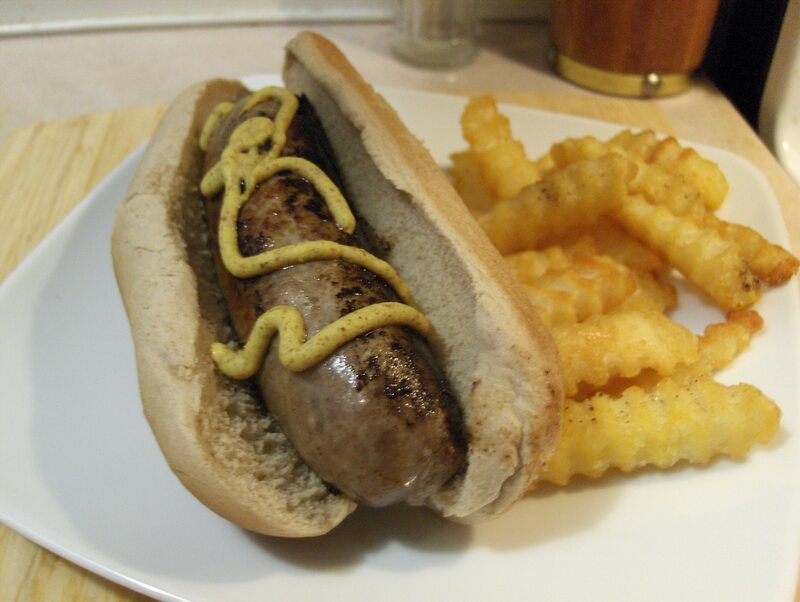 Backyards, ballparks, tailgating and outdoor gatherings demand a brat. Ours command an entirely new level of respect, delivering all the juiciness that signals fun, along with all the health benefits from our 100% grass-fed bison. Go ahead, take two. 4 Per Package / 1 lb. Ingredients: Buffalo, Organic Spices:[Black Pepper, Celery Seed, Coriander, Garlic Powder, Marjoram, Onion Powder, Pure Cane Sugar, Sea Salt] Encased in a natural pork casing. 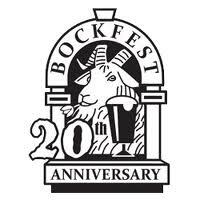 Bockfest 2012 – Celebrating 20 years! All about Bockfest! You can click on the link at the bottom to get all the info. Bockfest is a celebration of historic Over-the-Rhine, Cincinnati‘s brewing heritage and the coming of spring. There are several bock beer festivals that take place around the world, but Cincinnati‘s Bockfest is the oldest and largest in the United States. Bockfest occurs during the first weekend of March. It begins with a parade on Friday evening that starts at Arnold’s Bar & Grill, Cincinnati’s oldest saloon. The parade is lead by a goat pulling a keg of bock beer and the reigning Sausage Queen. It ends at Bockfest Hall where the ceremonial first keg is blessed, the best Parade entries are honored, and Bockfest officially begins. The Hall is open throughout the weekend and features live entertainment, great food, historic walking tours, authors and breweriana, a homebrew competition, Continental Sunday celebrations and lots of delicious bock beer. Bockfest is not just limited to the Hall. It occurs in a number of participating venues in Over-the-Rhine and the central business district. There is no admission fee for the hall and typically no admission fee for the participating venues. (If a venue charges a fee, it will be indicated on the event schedule.) A free shuttle bus runs a continuous loop around location, including Garfield Suites which is offering a special Bockfest Rate for festival goers. Brat Burgers?? That’s what I wondered when I ran across these at Walmart earlier today. I’m glad I did these Burgers are great! They come frozen, 6 to a box. These are big burgers, 1/3 lb. burgers! one is definitely a meal. A little high on calories at 350 and fat at 28g but the carbs are only 3g. You can grill them, broil them, or pan fry them which is the way I prepared them. Their ready in 15 – 18 minutes or until an internal temperature of 160 degrees, it was about 16 minutes. We topped them sliced Gouda or Sargento’s Reduced Fat Jack/Cheddar, French’s Golden Spicy Mustard, and Lettuce and served on a Healthy Life Whole Grain Bun. Thank you Johnsonville, I love these! I left a recipe from the Johnsonville web site along with the link. For a side I baked some Ore Ida Crinkle Fries. Dessert later a Smart Ones Chocolate Brownie Fudge Sundae. These are very good and only 140 calories! Prepare brat patties according to package directions. Keep warm. Place cooked Brat Patty on one half of the roll and top with sliced cheddar cheese. Wanted something easy to fix and filling. I made a Johnsonville Brat, first one in a long time! I usually have Turkey Brats but they were out of them at the store earlier so I decided to go with the Johnsonville Pork Brats. Just pan fried until brown, about 5 minutes, then added water the pan and boiled for 12 minutes. A really great tasting Brat! 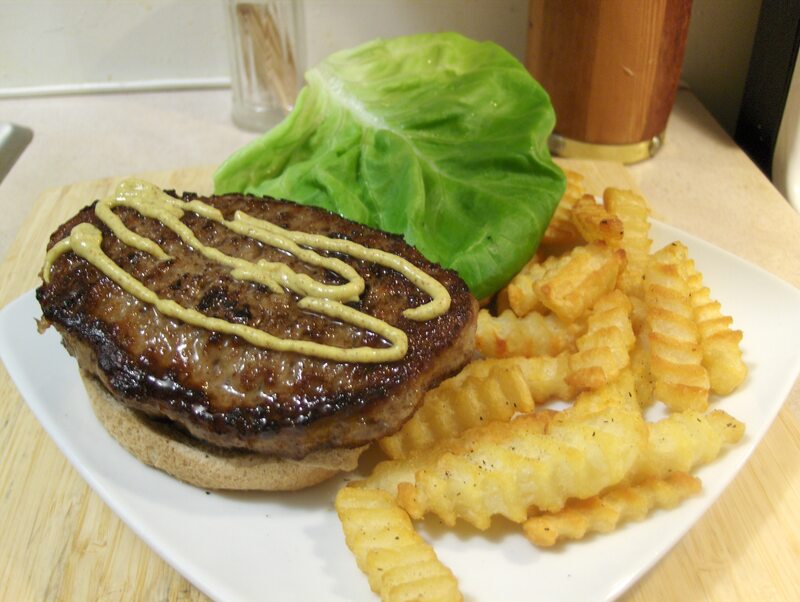 Served it on a Healthy Life Whole Grain Bun and topped with French’s Spicy Brown Mustard. Had Ore Ida Crinkle Fries as a side. For dessert later a Yoplait Delight 100 Calorie Chocolate Eclair Parfait. “Tis the season to be grilling fa la la la……” Fired the grill up and grilled some Hamburgers, Brats and Turkey Brats. I had the Turkey Brats, Honeysuckle White Turkey Brats. Along with grilling the Brats i also grilled some Pineapple Rings, recipe follows at the end of the post. First time I grilled Pineapple, I’ve lived a sheltered life! They turned out fantastic! Also had fresh Asparagus, I cut the stalks into three pieces and lightly fried them in extra Virgin Olive Oil and and I Can’t Believe It’s Not Butter. I added Almond slices and Crumbled Turkey Bacon and seasoned with Garlic Salt and Ground Black Pepper. Prepare and preheat grill. Combine brown sugar, juices, honey, and cinnamon in a small bowl until smooth. Spread this mixture on each side of each pineapple ring. Grill pineapple 4-5″ from medium coals for 5-10 minutes, turning once, until sugar mixture melts and pineapple is heated and tender, brushing with any remaining brown sugar mixture.